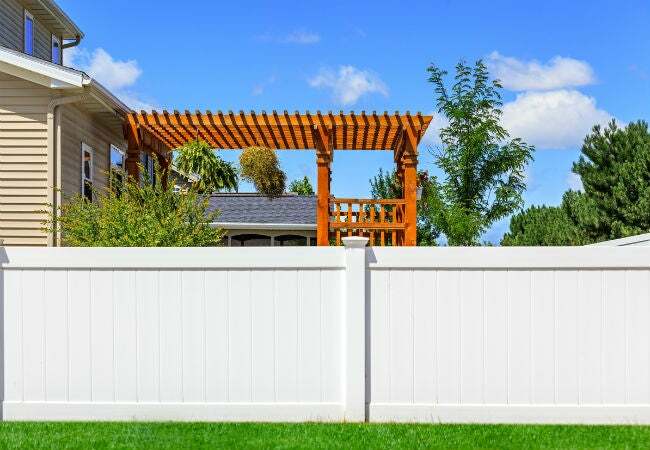 Learn all about two popular materials—each with various benefits and drawbacks—so you can install the ideal fence for your property. The iconic white picket fence symbolic of the American dream? It was surely made of wood. Yet wood fences also come in warm colors and design options that go far beyond the classic picket. Add in organic texture and the unique grain of each board and you can see why so many folks love a wood fence. Vinyl, however, is giving wood some stiff competition these days. This super-durable material often referred to as PVC, short for polyvinyl chloride, was introduced as fencing in the 1980s, but those early versions looked plastic-y and cheap. 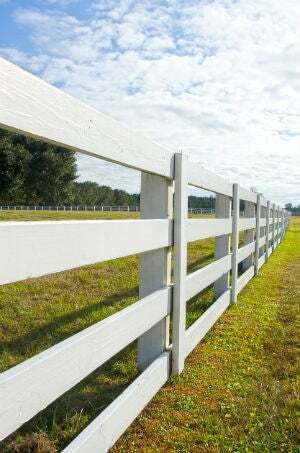 Improved composition has led to PVC fences that look more natural and are stronger and tougher than ever. The type of fence you choose will depend on your budget, aesthetic taste, and how much maintenance you’re willing to put in, among other factors. Read on to understand five notable differences in this material showdown—wood vs. vinyl—and you’re sure to pick the perfect fence material for your home. Vinyl costs more up front, but maintaining wood makes it pricier over time. Wood fencing typically costs about $12 per linear foot uninstalled, but a wood fence is bound to require maintenance, such as replacing boards as they warp or rot. Vinyl, which runs in the ballpark of $17 per linear foot, is virtually maintenance-free. Vinyl will also typically outlast wood fences, which are susceptible to weather, rot, insects, and other debilitating factors. It won’t warp or fade, and should essentially look the same and hold up as well as the day it’s installed, as long as it’s cleaned as needed. to be fully replaced after 10 to 20 years. Wood still looks more natural than vinyl. You can’t beat wood for organic warmth and traditional feel. It’s available in a seemingly endless number of options and design styles, from a privacy fence with a decorative scalloped top to a French Gothic-style picket fence. And when it comes to finishes, wood can be left in its natural state with simply a protective sealant, or stained or painted in virtually any hue you like. Among the most popular wood choices for fencing, cedar has a rich reddish color, tight grain, and minimal knots, while somewhat pricier redwood and teak have a highly desirable luster. The appearance of vinyl has improved over the last decade, and now you’ll find options with faux-wood grain and even find faux-stone looks. These finishes have upped the aesthetic ante somewhat but no one is going to be fooled and mistake vinyl for wood! Wood can be refinished. Vinyl cannot be painted or stained, so once you choose a color and style for your vinyl fence, that’s what it will look like for its life. If you continue to love it, great; if you change your mind, you’ll have to start anew. One of the wonderful things about a wood fence is that it can be painted and stained to suit your taste as time goes on. Vinyl fences are easier to keep clean. A periodic rinse with the garden hose is pretty much all it takes to banish dirt from a vinyl fence. A pressure washer makes even easier work of the job, so buying one might be a worthwhile investment if you’ll be installing a lot of vinyl fencing. Wood fences will likely need a power washing, and possibly the use of detergents, on a more frequent basis as their porous nature makes them susceptible to mold and mildew. Keep color in mind, too: White shows dirt more, so if you really want white, vinyl may be your best bet. Repairing vinyl is trickier than wood. Though vinyl is very durable, when damaged or broken—by extreme weather, for instance, or accidental impact during a backyard football game—it can be a pain to repair. Small holes or cracks can be fixed with a DIY vinyl fence repair kit from the home center; major damage may require calling in a pro. And because many vinyl fences are sold as large panels—up to eight feet squares—that are designed to look like individual pieces of wood joined together, you may have to replace the whole panel instead of just a few planks of wood. In this case, it also may be hard to track down your fence style if it has been discontinued. Wood may warp, rot, or weaken over time, but if it breaks it’s relatively simple to retrofit a piece to match. 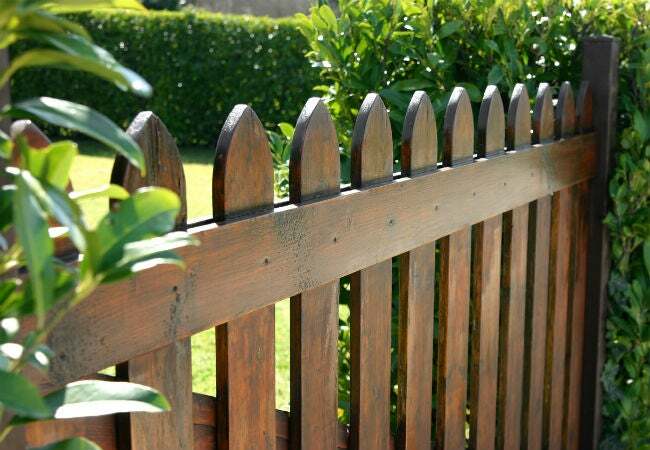 Follow this guide for the three basic steps to repairing a wooden fence.